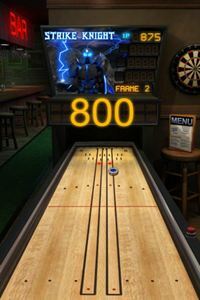 STRIKE KNIGHT is an addictive bowling game developed by Backflip Studios, the makers of the popular PAPER TOSS. The game has been designed with great graphic, cool sounds and animations effects to target anyone who loves flinging a puck at stuff, cool sounds, intense animations, timing based challenges and the outright admiration of their friends and family. To make it more challenges as compared to the traditional bowling game, the scoring system has been changed based on the time the user shots in conjunction with the user ability to pick up spares and strikes. Pass-and-play mode for up to 4 players. Real heckling from knight and other patrons. Real lightning sounds and effects. The STRIKE KNIGHT works well in iPod Touch, iPhone and the iPad. The game is sized at 13.7MB and runs on iPhone OS 3.0 or later. It is now available as a free download from App Store.